The UK holds internationally important breeding populations of many species of seabirds, and therefore has an obligation to keep an eye on their well-being. Seabird population dynamics are also a highly useful indicator of the health of marine ecosystems and environmental change. For example, analysis of data from the Isle of May confirmed that numbers of black-legged kittiwakes have declined by more than half since 1990 and linked this decline to ongoing climate change. The Isle of May Long-Term Study (IMLOTS) forms part of CEH’s network of long-term monitoring sites for detecting effects of environmental change, particularly climate change. The study is partly funded by the UK’s Joint Nature Conservation Committee (JNCC) as part of the Seabird Monitoring Programme. From its start in 1973, IMLOTS has grown so that today it is one of the most data-rich and complex studies of its type in the world. We use colour ringing to follow individuals and study their behaviour in detail. Repeated observations of colour-ringed individuals allow us to estimate the probability that a bird survives from year to year – the main factor affecting population growth in these long-lived birds. We also follow breeding success, measured as the average number of chicks fledged per breeding pair. Breeding success is more likely to respond to year-to-year changes in food supply. In combination, the monitoring of annual survival and breeding success allows us to understand the reasons why populations go up or down. To understand year-to-year variation in more detail, we also monitor the food that seabirds bring to their chicks. Variation in the importance or size of different fish species, or age classes of the same species, can have important repercussions for the birds and tell us a lot about conditions in the sea. For a methodology for collecting diet data in one of our study species, the common guillemot, see Instructions for collecting data on guillemot diet pdf. We also regularly analyse our long-term data and report the results in scientific journals. 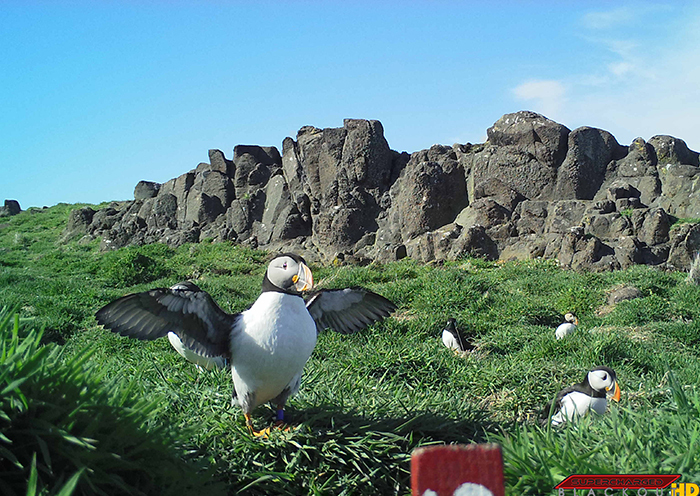 Photo: Puffins from CEH camera trap on the Isle of May (in May 2015). See a time-lapse video on YouTube. Like all components of marine food webs, seabirds are affected by ongoing and future climate change. Both fish and the plankton they feed on have shown clear changes in distribution, abundance and seasonal cycles, and this is bound to affect top predators like seabirds. Our unique long-term data allow us to disentangle climate effects from all the other factors affecting seabird populations, and we can also use data collected from seabirds to monitor effects on the marine environment in general. One of our most active areas of research is how seabirds would be affected by climate change, and how monitoring of seabirds could tell us about the impacts of climate change on coastal and marine environments. Rapid climatic changes are taking place in the seas around the UK, and this has led to major changes in the abundance, distribution and seasonal cycles of many marine organisms. These changes are particularly marked and rapid in the North Sea, and could have serious consequences for seabirds breeding on the Isle of May. Seabirds can be affected by changing climate both directly, eg if extreme weather becomes more frequent, or indirectly, through changes in their food supply. The evidence suggests that in most cases indirect effects are more important, and these are most likely to affect seabirds through their main prey species, the lesser sandeel. Unfortunately, this important forage fish is very difficult to study, and little is known about how it is affected by increasing sea temperatures. Our seabird studies indicate that in recent warmer years, birds have been struggling to find sufficient food for their chicks, because the sandeels have been either too few, too small, too lean, or have not been available at the right time. Several species of seabirds breed later and less successfully, and survival of adult birds is also lower in warmer years. However, these relationships are complex and may not hold for other regions. A further sign of the problems seabirds have in finding appropriate food came in 2005 when a new prey species was reported for several species and several colonies. The snake pipefish does not seem to be appropriate food for seabird chicks as it is of low nutritional value and very difficult to swallow. Ammonia (NH3) is an important agent of environmental perturbation owing to its potential to cause both eutrophication and acidification in ecosystems. Breeding seabird populations are likely to be significant emitters of NH3 not only because they occur in high densities, but also because they import large quantities of nitrogen from their offshore feeding grounds. The excretion of these nutrients may, under suitable meteorological conditions, result in large emissions of NH3 into the atmosphere. In a project funded under the NERC GANE (Global Nitrogen Enrichment) thematic programme, we studied NH3 emissions intensively from two seabird colonies in the Firth of Forth, SE Scotland – the Isle of May and Bass Rock. Various methods were employed to measure atmospheric NH3 concentrations both on and offshore from the colonies. The first method was ALPHA (Adapted Low-cost Passive High Absorption) passive samplers. The ALPHA sampler consists of a circular polyethylene tube containing an acid coated filter paper. It captures ammonia from the air which diffuses through a PTFE membrane at the open end. As the diffusion path length and area are known, in addition to the length of the exposure period, it is possible to calculate the concentration of atmospheric NH3 as an integrated average for the exposure period. The passive sampler NH3 monitoring campaign on the Isle of May was designed to give an idea of the variability in atmospheric NH3 concentration near birds with differing nesting behaviour. Sites included those predominantly inhabited by guillemots/razorbills, puffins, gulls, kittiwakes, and shags, in addition to sampling NH3 in areas with few birds present or at significant distance from the ALPHA samplers (control sites). The results observed so far support the hypothesis that most emissions of NH3 on the Isle of May are from areas inhabited by breeding guillemots / razorbills, as a result of their nesting behaviour. As these species breed on bare-rock cliffs, the NH3 content of the guano they deposit at the colony will remain available for volatilisation, even after their departure from the island at the end of the breeding season. Conversely, puffins spend less time above ground at the colony and are therefore less likely to deposit guano. NH3 concentrations were highest during the main period of bird occupancy at the colony (June/July) but still remained high for one month after the departure of the birds in mid-July. This lag is probably due to the guano deposited at the colony retaining its NH3 content for some time until meteorological conditions are favourable for its volatilisation to the atmosphere. Real-time atmospheric NH3 measurements were made offshore from the Isle of May and used in conjunction with a Gaussian plume dispersion model. This method gave NH3 emission estimates for the Isle of May of 3 ± 0.8 tonnes NH3 per year based on July 2000 data, and 6 ± 6 tonnes NH3 per year based on May 2000 data. These figures correlate well with those produced using data on bird numbers, colony attendance and nesting behaviour (8.67 tonnes NH3 per year for the Isle of May). Data are also being collected on ammonia emissions from other seabird colonies around the world. Together with the intensive studies on the Isle of May, an estimate of global emissions of NH3 from seabird colonies will be made.